I'm working on SAP S/4HANA ON PREMISE to adjust custom database views with base tables including BSIS transparent table in previous SAP system which is a DDL SQL View in SAP HANA database. 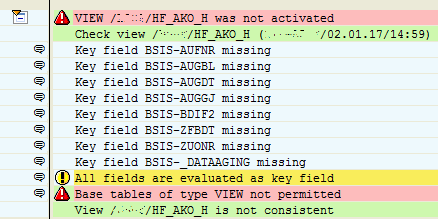 Since in a definition of a view in SAP S/4HANA system, it is not allowed to other views just like in other SAP systems, these custom views with BSIS, BSAD for example does not activate on the SAP S/4HANA. Base tables of type "VIEW" not permitted error is the exception displayed when such database views are tried to activate. When ABAP developer displays SAP database view using SE11 transaction and tries to activate view, following error occurs. Switch to the Table/Join Conditions tab in Database View definition screen. As you see BSIS which was a transparent ABAP database table in previous versions of SAP ERP. As you see in below screenshot, BSIS is not a transparent table in new SAP S/4HANA systems. BSIS is a DDL SQL View afterwards. This is one of the tables changed into view in SAP with SAP HANA migration. BSIS_BCK is a transparent table for "Accounting: Secondary Index for G/L Accounts"
Just like new BSIS DDL SQL View, BSAD is also converted from SAP Transparent Table to DDL SQL View. BSAD table has also a new transparent table BSAD_BCK that developers can temporarily activate their custom views by replacing BSAD with BSAD_BCK. 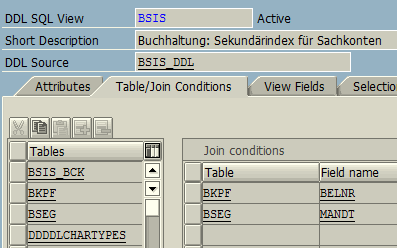 In fact BSAD_BCK union with joined fields of BKPF and BSEG tables forms the data of new BSAD view. An other transparent table which is changed to DDL SQL View with SAP S/4HANA is BSAS table. You can find a transparent table in your new SAP HANA system named BSAS_BCK too.